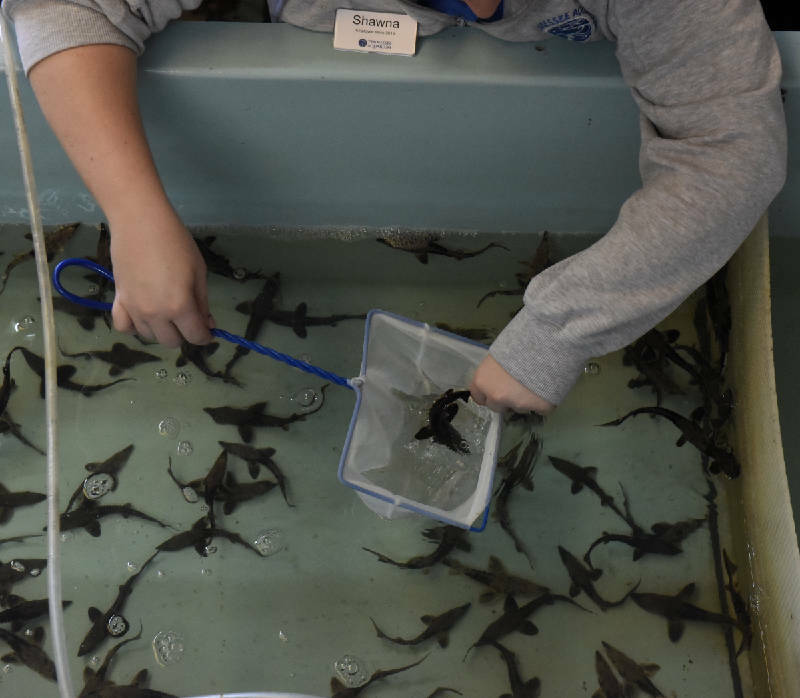 Science coordinator Shawna Mitchell holds a juvenile lake sturgeon at the Tennessee Aquarium's Animal Care Facility on Wednesday, Oct. 7, 2015, in Chattanooga, Tenn. About five inches long, this fish will be part of a Thursday release of 1,000 lake sturgeon on the French Broad River east of Knoxville. Anna George sounds almost like a proud grandmother-to-be. For 15 years, her team has been slowly stocking the Tennessee River basin with lake sturgeon, the once-common monster fish that ranged from the Great Lakes all the way to the Mississippi River. Now, finally, the young that were released into the river have grown up and are almost ready to have offspring of their own. And George, who heads the Tennessee Aquarium's Conservation Institute, can hardly wait. "We think they'll need to be between 13 and 17 years old to spawn," she said. Since the program to restock the river started in 2000, baby sturgeon should soon start showing up in most of the Tennessee River. Once the population grows big enough to be self-sustaining, recreational fishing of the species would again be allowed. A full-grown lake sturgeon is huge, growing up to 8 feet and topping out at 300 pounds. It looks like a cross between a catfish and an alligator, with four long whiskers, called barbels, dangling from its pointed snout, and bony plates along its back and sides. Its body is virtually unchanged from the time its ancestors swam among the dinosaurs, scientists say. The sturgeon spends most of its time poking around in the mud at the bottom of a river, looking for worms, clams, insect larvae or fish eggs. Adults often live to be 70 years old, with one female believed to be an astounding 154 years old. Because it lives a long time, it is slow to mature, with females starting to spawn around the age of 13, in warmer waters, and as old as 25 in colder northern lakes and rivers. That's why it is hard for George to say how successful the restocking program in Tennessee has been. More than 180,000 young fish have been released into the Tennessee River basin since 2000. Another 1,000 raised by the Tennessee Aquarium are being released early Thursday morning in the French Broad River near Knoxville as part of a program operated jointly by the Aquarium, the Tennessee Wildlife Resources Agency and TVA. "We go up in the spring and collect the eggs from the Great Lakes and then send them to a hatchery in north Georgia," said Thom Benson, communications manager for the Aquarium. After they are hatched, the Aquarium takes over, Benson added, raising them until they are big enough to be released into the wild — about 5 to 7 inches. A lot of those youngsters don't survive, but exactly how many is hard to pinpoint. "At that size, there are plenty of sturgeon predators," George said. "Catfish are eating them, and we have found sturgeon skulls in an osprey nest." The mortality rates drop off once lake sturgeon reach about a foot in length. The biggest lake sturgeon predator — humans — has been tamed for now. In the late 1900s, lake sturgeon were plentiful throughout the Mississippi River basin and the Great Lakes, but overfishing decimated the species. By 1998, the lake sturgeon was on the endangered species list. It is illegal to catch the fish in Tennessee, although researchers are asking fishermen who catch one to take a photo before releasing it and send information on where they caught it to the Tennessee Wildlife Resources Agency. They've even set up a website to make it easy, www.icaughtone.org. Although George is cautious about declaring the restocking program a success, she's almost certain it is on the right track. Her team has received reports of lake sturgeon from Knoxville, down to Chattanooga, through Lake Guntersville in Alabama, and into Kentucky Lake near the Tennessee-Kentucky state line. "They have worked themselves quite a way down the Tennessee River," she said, "Anyone in Tennessee could encounter a lake sturgeon." Scientists have implanted tracking devices on 57 of the lake sturgeon released in recent years and all of them have been "seen" by monitoring devices scattered along the river. And the fish are showing up when researchers perform an annual survey of the river. "Most of the habitat between Knoxville and Chattanooga is pretty well-occupied by sturgeon," George said. George won't be happy until she sees baby sturgeon in the river who haven't been placed there by her team. "We have always thought this would be a 20-year program," she said. "At that point, the oldest fish would be at spawning age and the population would be self-sustaining." Contact staff writer Steve Johnson at 423-757-6673 or sjohnson@timesfreepress.com. Science coordinator Shawna Mitchell removes a juvenile lake sturgeon from her net as she scoops out leftover food from one of their tanks at the Tennessee Aquarium's Animal Care Facility on Wednesday, Oct. 7, 2015, in Chattanooga, Tenn. These fish will be part of a Thursday release of 1,000 lake sturgeon on the French Broad River east of Knoxville.